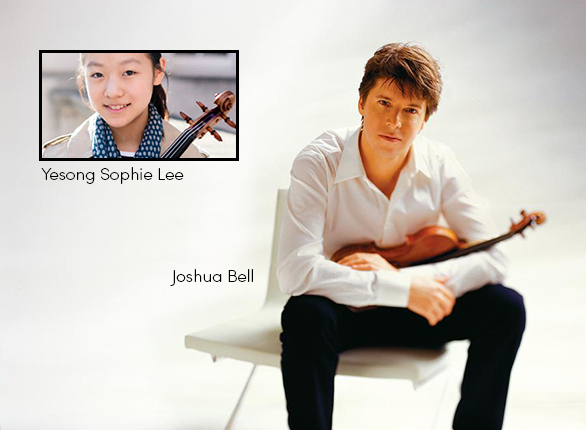 August 11, 2017 – Richmond, VA – The Richmond Symphony’s opening night concert will feature the extraordinary talent of violinists Joshua Bell and 13-year-old Yesong Sophie Lee. The concert, which originally featured Lang Lang performing Beethoven’s “Emperor Concerto,” will now feature Bell and Lee performing J.S. Bach’s Double Violin Concerto and Bell performing Lalo’s Symphonie espagnole for Violin and Orchestra. Joshua Bell was last in Richmond in 2014 when he performed Bruch’s Concerto No. 1 in G minor with the Orchestra to great applause. In the days immediately following, the Symphony was already receiving questions about when he could return.With a career spanning more than 30 years as a soloist, chamber musician, recording artist and conductor, Joshua Bell is one of the most celebrated violinists of his era. An exclusive Sony Classical artist, Bell has recorded more than 40 CDs garnering Grammy, Mercury, Gramophone and Echo Klassik awards and is a recipient of the Avery Fisher Prize. Named the Music Director of the Academy of St. Martin in the Fields in 2011, he is the only person to hold this post since Sir Neville Marriner formed the orchestra in 1958. Bell has collaborated with countless artists in and outside the classical arena and performed on television shows including the Grammy Awards, numerous Live from Lincoln Center specials and on movie soundtracks including the Oscar-winning film, The Red Violin. Bell received his first violin at age four and at 14 performed with Riccardo Muti and the Philadelphia Orchestra, followed by his Carnegie Hall debut at 17. Perhaps the event that most transformed his reputation from ‘musician’s musician’ to ‘household name’ was his incognito performance in a Washington, D.C. subway station in 2007 for a Washington Post article which thoughtfully examined art and context. The cover story earned writer Gene Weingarten a Pulitzer Prize and sparked an international firestorm of discussion which continues to this day. He serves on the artist committee of the Kennedy Center Honors, the New York Philharmonic Board of Directors, and Education Through Music. New to Richmond will be thirteen-year-old violinist, Yesong Sophie Lee. The 2016 International Menuhin Competition Winner, Lee “…is quickly building an international following as an emerging young virtuoso of outstanding potential; (The Violin Channel) as “a huge talent” (Kulture Radio, Berlin) and “her playing was silk-toned, notable especially for the intensity it maintained…a real homage to Menuhin” (The Guardian, London). Yesong Sophie Lee performed as soloist with the London Philharmonia and Berlin Konzerthaus Orchestra, toured the UK appearing at several festivals and even performed for Prince Charles. She played at the Gstaad Festival, the Kronberg Academy Violin Masterclasses and Concerts, and on NPR’s From the Top. Upcoming performances include the Prokofiev G Minor Concerto with the Seattle Symphony in the 2017-18 season. A student of Simon James, Yesong Sophie Lee has played for Augustin Hadelich, James Ehnes, Christian Tetzlaff, Leila Josefowicz, Anna Chumachenco, Sergey Khachatryan, Arabella Steinbacher, Jamie Laredo, Paul Kantor, and Robert Lipsett among others. This 60th Anniversary Signature Event is sponsored in part by Altria, Covington Travel and Genworth. Additional support is provided by The Virginia Commission for the Arts and The National Endowment for the Arts. This concert is also supported in part by a generous grant from the American Orchestras’ Futures Fund, a program of the League of American Orchestras made possible by funding from the Ann & Gordon Getty Foundation. Kicking off its 60th Anniversary Season in September 2017, the Richmond Symphony is the largest performing arts organization in Central Virginia. The organization includes an orchestra of more than 70 professional musicians, the 150-voice Richmond Symphony Chorus and more than 260 students in the Richmond Symphony Youth Orchestra programs. Each season, more than 200,000 members of the community enjoy live concerts and radio broadcasts. The Symphony also provides educational outreach programs to over 55,000 students and teachers each year. The Symphony was recently named one of 21 American orchestras selected as a leader in orchestra innovation by the League of American Orchestras through its Futures Fund Initiative. The Richmond Symphony is partially funded by the Virginia Commission for the Arts and the National Endowment for the Arts. Visit www.richmondsymphony.com.